This video was posted recently on Youtube and on the Guardian website here. This was originally created as part of the Virgin Media group’s actions to support consumers, particularly in the use of the web and digital media. Switched on Families is about giving parents clear, honest, useful (and sometimes even fun) support to make sure your family gets the best from the web. …and covers information for parents on all the big digital issues like who to trust, digital addition, what to share, and how to play nice online. This information is filtered by child development stages and also features videos with families talking about the choices they’re making online. Well done to Virgin Media for making this available. This is a great video, giving an insight into the thoughts and approaches from some the Wikipedia contributors. Wikipedia is one of the great internet phenomena and a fantastic example of community collaboration, and volunteerism. It demonstrates our desire as a species to bring sense and order to our world, and to describe and document almost every aspect of our existence in our surroundings and to one another. A free and open world depends on a free and open web! On December 3rd the International Telecommunication Union (ITU) is bringing together regulators from around the world to re-negotiate a decades-old communications treaty. Text taken from Google’s Take Action Web site. Please watch this video – and consider adding your voice. Over the past few weeks, you stood with millions from all corners of the world who took action in support of a free and open Internet. Your voice was heard. Some governments sought to use the recent meeting of the International Telecommunication Union in Dubai to increase censorship and regulation of the Internet. At the conclusion of the meeting last Friday, 89 countries signed the treaty, while 55 countries said they would not sign or that additional review was needed. We stand with the countries that refused to sign, and we stand with you. We we want to thank you for your actions over the past few weeks. Your voice helped shine a light on a process that would otherwise have been in the dark, and you helped bring the issue of Internet freedom to global prominence. With your support, we can continue to help ensure that governments alone do not direct the future of the Internet. Thank you. The folks at Paralegal.net got in touch. Read the infographic and decide for yourself, also pop by their infographics section to browse other interesting comments and statistics. I only recently wrote about the recent apps integration within the Spotify client (link). So it was with interest I learnt of the new music service from The Lounge. The Lounge is a full music streaming service with a large on-demand music album catalogue, play back from commercial and public broadcast services and audio hardware integration with Pure Radio devices. The fact The Lounge has a several artists that are absent from Spotify (e.g. Led Zeppelin, Metallica, Pink Floyd) and the direct hardware support, make it a very interesting proposal. So it does make good competition for Spotify at least in the UK. No, not at present. I am not ready to move across. Why? However, that integration with Facebook is a feature I enjoy and appreciate. Also the integration with Last.fm is also very important, the ability to scrobble and build my play list into Last.fm is important from a personal viewpoint of tracking my own journey through music. Finally the effort of curation and assembling playlists all over again, is a barrier too far. Not inconsiderably effort has gone into their assembly and now they’re created in Spotify, they are shareable and subcribable. To lose that library of musical taste and disconnect from the sphere of musical sharing is not something I can not stomach. The Infographic from lastgraph (at the top of the post) is a great example of the app and service I benefit from the extensibility from Spotify and Last.fm – the “limitations” in catalogue are bearable for service amenities such as these. I don’t have any playback devices for Spotify apart from the PC | Laptop but there are audio device options (e.g. Logitech) which I have put on that “wish list”. So what do you think? Is the The Lounge for you? Spotify actually announced this last year (link). However, as a user I just recently received the update. This is a cool update to a favourite app of mine. It makes services like Last.fm much more integrated and useful, and helps fuel useful recommendations and sharing. It’s clear that the services integration “the app-store mind set” is coming through more and more. There is a clear move to application extensions within applications. Below is some of the explanation of why the Wikipedia black-out took place. Wikipedia is protesting against SOPA and PIPA by blacking out the English Wikipedia for 24 hours, beginning at midnight January 18, Eastern Time. Readers who come to English Wikipedia during the blackout will not be able to read the encyclopedia. Instead, you will see messages intended to raise awareness about SOPA and PIPA, encouraging you to share your views with your representatives, and with each other on social media. SOPA and PIPA represent two bills in the United States House of Representatives and the United States Senate respectively. SOPA is short for the "Stop Online Piracy Act," and PIPA is an acronym for the "Protect IP Act." ("IP" stands for "intellectual property.") In short, these bills are efforts to stop copyright infringement committed by foreign web sites, but, in our opinion, they do so in a way that actually infringes free expression while harming the Internet. Detailed information about these bills can be found in the Stop Online Piracy Act and PROTECT IP Act articles on Wikipedia, which are available during the blackout. GovTrack lets you follow both bills through the legislative process: SOPA on this page, and PIPA on this one. The EFF has summarized why these bills are simply unacceptable in a world that values an open, secure, and free Internet. Why is the blackout happening? Wikipedians have chosen to black out the English Wikipedia for the first time ever, because we are concerned that SOPA and PIPA will severely inhibit people’s access to online information. This is not a problem that will solely affect people in the United States: it will affect everyone around the world. Why? SOPA and PIPA are badly drafted legislation that won’t be effective at their stated goal (to stop copyright infringement), and will cause serious damage to the free and open Internet. They put the burden on website owners to police user-contributed material and call for the unnecessary blocking of entire sites. Small sites won’t have sufficient resources to defend themselves. Big media companies may seek to cut off funding sources for their foreign competitors, even if copyright isn’t being infringed. Foreign sites will be blacklisted, which means they won’t show up in major search engines. And, SOPA and PIPA build a framework for future restrictions and suppression. I don’t live in the United States. How can I help? As a non-US resident I took an action to call my own government representatives to stand up for fair and effective legislation around internet access and services. This is an image from WordPress home page during the blackout. Well, it’s actually be running a while now. I’ve just not got around to blogging about. I decided to go and purchase the components of the new system and put them together myself. It took a couple of evening over a week to do it; and I now feel like I’ve got a good grasp of the hardware basics that go into constructing a desktop computer. Here are the components:- . I didn’t go for a flashy case, keeping that to a low cost, while emphasizing the performance capabilities of the machine on the guts, motherboard, CPU and RAM. 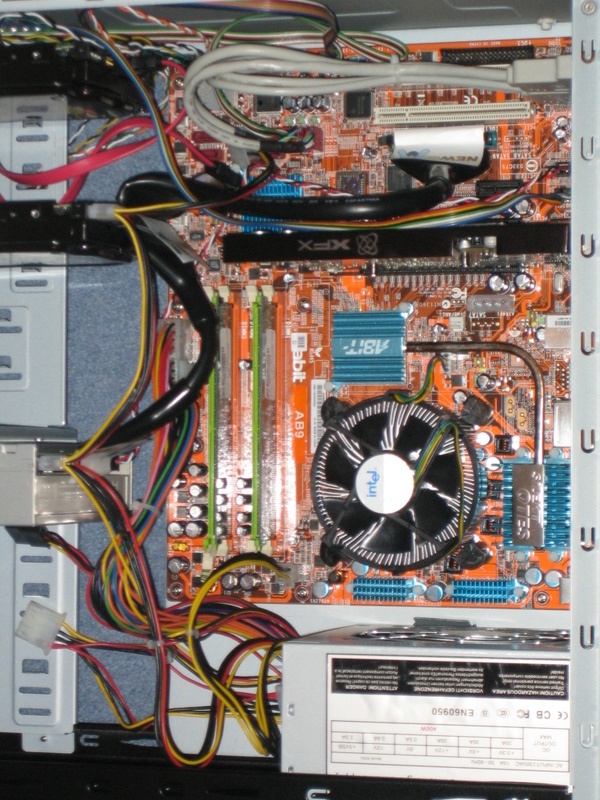 Here are the internal once put together:- All in all it cost about the same to the bargain basement machine we got from PC world about 4 years old, just that this time I’ve gone to some effort to ensure that it is a bit more future proof then the last machine – you can see the size of the CPU fan compared to the rest of the component space on the motherboard! This is not about some deadly Police officer, rather that the Home Computer has perished. Unfortunately I am not a skilled hardware technican, but from the manner in which behaves I think the motherboard has gone. The PC powers on the fans, and power supply, but no disk activity occurs and even when the RAM is removed no error warnings are forth coming. I hope that does mean that the hard disk in still intact, and the data is still ok. I have made back ups but, none that recently. I am thinking of the best way to replace the kit. The dead PC is over 5 years old, so that the hardware is not worth keeping, only the some of the periphicals that could be placed in a replacement. I am wondering if the best replacement balancing performance, cost and reasonable amount of future proofing. Would it better to purchase a complete replacement PC – just the PC itself. 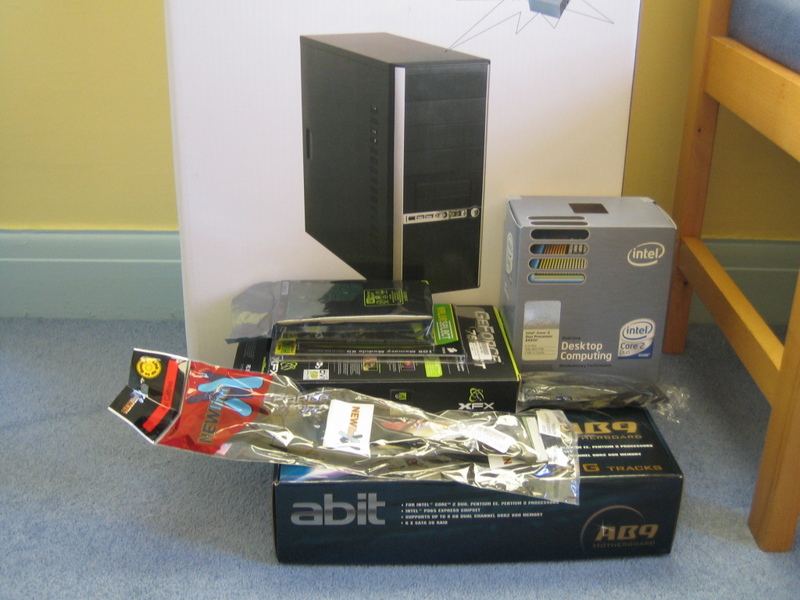 Or build a PC from scratch or get a bare bones system? I would like to try the barebones options, to get more familiar with the hardware side of things; I am not perhaps ready to do the build it yourself process – and I think that is quite a costly option. I’ll let you know how things progress.